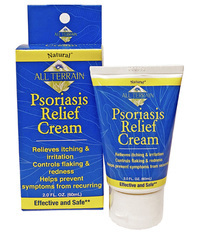 Psoriasis Relief Cream, 2 fl oz / 60 ml (All Terrain Co.) - Penn Herb Co. Ltd. ACTIVE INGREDIENT: Salicylic Acid 3% .........Anti-Itch. INACTIVE INGREDIENTS: Aqua (Water), Capric /Caprylic Triglycerides, Aloe Barbadensis Leaf Extract, Zea Mays (Corn) Starch*, Kaolin, Stearyl Alcohol, Glyceryl Stearate, Glycerin, Squalane, Colloidal Oatmeal, Zinc Oxide, Gluconolactone, Sodium Benzoate, Xanthan Gum, Allantoin, Butyrospermum Parkii (Shea) Butter, Potassium Sorbate, Bisabolol, Eucalyptus Globulus Leaf Oil, Melaleuca Alternifolia (Tea Tree) Leaf Oil, Citric Acid, Azadirachta Indica (Neem) Seed Oil. *Organic Ingredient. Cruelty Free. 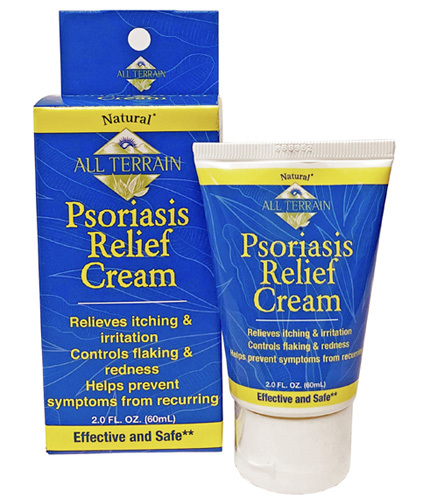 For relief of skin itching, irritation, redness, flaking and scaling associated with psoriasis; controls and helps eliminate the recurrence of symptoms associated with psoriasis. Apply to affected area 1-4 times daily or as directed by a doctor. >br>WARNINGS: For external use only. Stop use and ask a doctor if: condition worsens or does not improve after regular use of this product as directed; condition coves a large area of the body.